Maison Ikkoku (めぞん一刻, Maison Ikkoku?) is a graphical text-adventure game developed by Micro Cabin and published on multiple popular Japanese home computer systems towards the end of 1986. It was ported to the Famicom by Bothtec in 1988. Micro Cabin then ported the game one final time to the PC Engine in 1989. 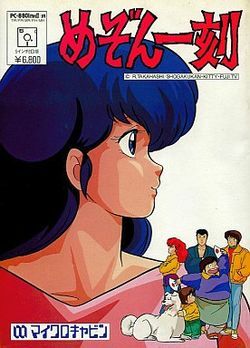 The game is based on the popular manga and anime series of the same name, Maison Ikkoku. The story is a bitter-sweet comedic romance involving a group of madcap people who live in a boarding house in 1980s Tokyo. The story focuses primarily on the gradual developing relationships between Yusaku Godai, a poor student down on his luck, and Kyoko Otonashi, a young, recently-widowed boarding house manager. In the game, you take the role of Godai performing various missions that deal with the storyline of Maison Ikkoku. You have to avoid Yotsuya's pranks, save money to throw a party, proclaim your love for Kyoko and other things. The action takes place all over Tokeizaka and not just the boarding house. Players can visit Soichiro's grave, Chachamaru, the train station and many other familiar locales. No version of the game was ever released outside of Japan. However, a fan-translation of the PC-Engine version was produced which translates the game into English. More information about the translation patch can be found here. This page was last edited on 11 September 2013, at 01:57.